Sen. Lindsey Graham (R-SC) on Saturday lauded President Donald Trump’s compromise proposal to end the partial government shutdown and expressed enthusiasm about turning the plan into law. President Trump offered Democrat leaders a three-year extension on the temporary legal status of 700,000 “Dreamers” — immigrants who were brought to the United States illegally by their parents — plus a three-year extension of the temporary protected status (TPS) for 300,000 immigrants whose status faces expiration. The president floated $805 million in port and border screening security and $800 million worth of humanitarian aid. Further, he vowed to hire 2000 additional border agents and 75 more immigration judge teama to handle the backlog of border cases. A fantastic proposal Mr. President! Last month, Graham urged the White House and Democrats to back what he described as a “breakthrough” compromise to re-open the government, now in its 29th day of partial shutdown – the longest in U.S. history – which would trade protections of Deferred Action for Childhood Arrivals (DACA) and Temporary Protected Status (TPS) recipients for $5 billion in wall funding. Following a two-hour lunch at the White House, the South Carolina Republican signaled the president was open to supporting the proposal, which would entail backing the Bridge Act — a bill championed by Graham that would give DACA holders three-year extensions on their work permits. The proposed legislation would also give TPS recipients an extension on their status. “I think that’s in the realm of possibility. The president didn’t commit, but I think he’s very open-minded. 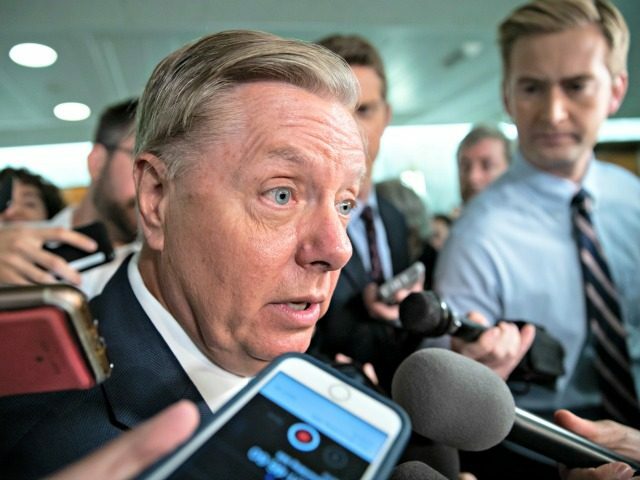 I know there’s some Democrats out there who would be willing to provide money for a wall, border security, if we could deal with the DACA population and TPS people,” Graham told reporters at the time. “I don’t see Democrats giving us more money, unless they get something,” he added. “The border patrol agents have repeatedly asked for three items: a physical barrier, more technology, and more agents and officers. As members of Congress, we must deliver for them,” she added. However, almost immediately after the president’s offer, House Speaker Nancy Pelosi (D-CA) and Senate Minority Chuck Schumer (D-NY) balked at the deal, adding to a list of compromises the Democrats have shot down from the White House. Democrats were hopeful that the President was finally willing be to re-open government and proceed with a much-need discussion to protect the border. Unfortunately, initial reports make clear that his proposal is a compilation of several previously rejected initiatives, each of which is unacceptable and in total, do not represent a good faith effort to restore certainty to people’s lives,” she said in a statement. … It is unlikely that any one of these provisions alone would pass the House, and taken together, they are a non-starter.